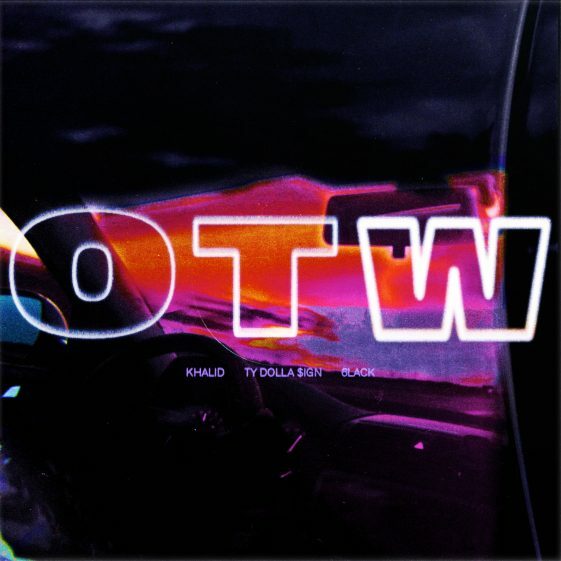 (Los Angeles, CA)—Today, Multi-platinum global superstar Khalid releases a brand-new track entitled “OTW” featuring Ty Dolla $ign and 6lack. The song is available now at all digital retail providers via Right Hand Music Group/RCA Records. Khalid’s most recent release “Love Lies” with Keep Cool/RCA Records’ Normani is off to an explosive start having debuted at #43 on the Billboard Hot 100 and it has already received over 200 million streams worldwide since its release on February 14th. The track, which was just certified GOLD by the RIAA, is garnering critical acclaim with MTV calling it “a match made in musical heaven” and The FADER calling it a “slow-burning R&B ballad”. Since its release, the track has racked up over 150 million streams on Spotify alone, and the song’s official video has over 30 million views on YouTube. “Love Lies” also broke the Top 5 on the streaming platform’s US (#2) and Global (#3) Viral Charts. Additionally, Khalid he will be hitting the road again on “The Roxy Tour”, which will be making a number of stops in major cities including Los Angeles, Atlanta, and Philadelphia. Tickets for “The Roxy Tour” are on sale now and can be purchased here. See full list of tour dates below. Five-time Grammy® nominated artist Khalid released “Location” before his high school graduation and it garnered over 1.52 million plays in less than two months, which led to his major label deal with Right Hand Music Group/RCA Records. Khalid’s debut album, American Teen, has received mass critical acclaim with praise from The New York Times, TIME Magazine, Billboard, NYLON, and many more. Billboard stated, “…effortlessly excellent…the kid is still so young, but this body of work is beyond his years”. Khalid has also performed on The Tonight Show Starring Jimmy Fallon, The Ellen DeGeneres Show, Good Morning America, The Late Late Show With James Corden, Jimmy Kimmel Live!, The Late Show With Stephen Colbert, The Today Show, and at this year’s SXSW where he won MTV’s Woodie To Watch Award. Additionally, Khalid embarked on his first-ever headlining tour in both the U.S. and select European cities where he sold-out every single date before the album was even released. In addition to his own headlining tours, Khalid has toured with the likes of Lorde and Travis Scott. He has also been featured on a number of collaborative songs including mega hits “1-800-273-8255” with Logic and Alessia Cara, and “Silence” with Marshmello. Khalid has over one billion streams worldwide across all partners, and he is one of two solo teenagers to reach the top 10 on the Billboard 200 in the last 12 months. This summer, Khalid was the face of Forever 21’s Summer Digital Campaign, #F21xMusic, Men’s Line, and was named MTV Push: Artist to Watch for the month of July. He was nominated for a 2017 BET Award for Best New Artist, a Teen Choice Award for Choice R&B/Hip-Hop Song for “Location”, and a 2017 American Music Award for Favorite Song-Soul/R&B for “Location” where he also performed a show stopping mash-up of “Young Dumb & Broke” and “Thunder” with Imagine Dragons. Khalid also won Best New Artist at the MTV Video Music Awards, recently landed on the cover of Billboard’s 2018 Grammy® Preview issue, and is Grammy® nominated for Best New Artist, Song of the Year (“1-800-273-8255” – Logic Featuring Alessia Cara & Khalid), Best R&B Song (“Location”), Best Urban Contemporary Album (American Teen), and Best Music Video (“1-800-273-8255” – Logic Featuring Alessia Cara & Khalid). Khalid’s “Location” is officially certified 4x Platinum by the RIAA, and his latest single “Young Dumb & Broke” is also certified Platinum.